State's tribes devote resources to preserving their languages"I think the language issue is the most critical in Indian Country," Grounds said. "We need to realize the other problems we have in tribes will be there in 10 years; our languages won't be." According to the Intertribal Wordpath Society, only 27 of Oklahoma's 38 tribes have language speakers left. Some tribes, such as the Ottawa, Otoe, and Delaware, have an estimated speaker count of less than five each, the society says. Grounds said those who are attempting to save a tribal language, especially in smaller tribes, face two critical hurdles--financial and cultural resources. "Sometimes, we go to language preservation seminars and we cannot relate to them on the same page, because there are such big differences in what they can do and what we can realistically do," he said. A successful gaming operation can bolster a tribe's language efforts. The Cherokee Nation allocated $1.4 million to its language revitalization program in fiscal year 2005 and increased that amount to $2.5 million in fiscal year 2006, officials said. Endangered languages of our ancestors can flourish againIf we continue to ignore these truths, this loss will come to pass just as certainly as the sun continues to rise and set in the sky. Yet, just as an eclipse shows us that sometimes the inevitable patterns of nature can be altered, so do we have the ability to change our future when it comes to saving our languages. But we cannot wait. Fortunately, we are blessed to have the solution to language recovery in our hands. Offered to us by our indigenous brothers and sisters from around the globe, the language-immersion education programs developed by the Maori of New Zealand and Native Hawaiians have shown us that we can reverse the rapid loss of our languages. From them, we know that it is possible for our languages to flourish again. Handheld 'Phraselator' helps preserve North American native languagesWhite Eagle, a Ponca tribal citizen and Henry Lieb, 80, are two of the few people who speak the Ponca language. The Ponca Tribe has only about two dozen fluent speakers among its 3,000 tribal members, said Dan Jones, tribal chairman. With the help of the Phraselator P2, a handheld device capable of recording and playing back thousands of phrases, words, songs and stories, White Eagle and Lieb recorded their native language Wednesday. 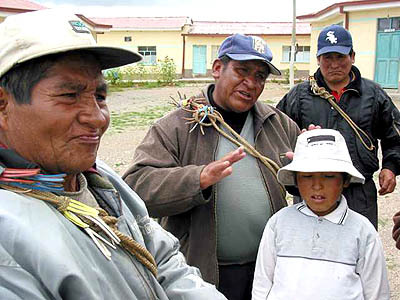 Microsoft Programs Use Andean LanguageEvo Morales has a new ally in his quest to promote Indian languages--U.S. software giant Microsoft Corp.--which is teaming up with the Bolivian president for the local debut of Windows and Office software in the Andean tongue of Quechua. "The translation of these technologies into Quechua helps to re-value the language so that it will not be lost over time," Javier Medrano, spokesman for Microsoft's Bolivia operations, told The Associated Press on Wednesday. 'We're playing a catch-up game'The volume of words spoken in households each week is tied closely to family income, said Elementary School Principal Charles Cook. The disparity in word count between poor families and wealthy families is staggering. "Extrapolate the difference over a few years, and that's millions of words," Knutson said. "We're playing a catch-up game." Kids find the wordsThis week, about 50 young tribal members are attending Lushootseed Language Camp. They are learning with game show-style quizzes, with computer programs developed by the Tulalip Tribes, and by practicing a play that uses English and Lushootseed phrases. They will perform the play this morning at the Tulalip Amphitheatre. Better Education Through Comic BooksTo finally get to the point, I believe I owe most of my early education to comics, and argue that they should become a staple of classroom learning. Most people are visual learners, meaning they associate specific pieces of information with a particular image. Really, comic books are simply an extension of A-B-C picture books (A is for Apple, B is for Bear, C is for Calliope, etc.). Comics simply provide more information as it corresponds to provided text. For instance, when Donald Duck says “I'm gonna whip your tail feathers off” and you see a picture of Donald grimacing, rolling up his sleeve and holding a tree branch, you have a pretty good idea as to his intentions. Books open up a world of imagination for children on reserves and can lift them from a life of poverty and despair Even the death of a young woman couldn't keep youngsters from their summer literacy program, writes Louise BrownIn isolated northern reserves, where many families struggle with poverty and unemployment, children speak the Oji-Cree dialect at home and often pick up English from satellite TV until they begin learning their ABCs in Grade 1. So weaving literacy into summer fun can give an academic boost, says Bartleman, who has raised more than $4 million from both government and private donors to run 35 literacy camps as well as a free book club for students across northern reserves that will continue after his term ends next spring. "It's not the panacea, but we're doing something, with resources from the communities themselves," Bartleman says during a visit to camps in Wunnumin Lake and nearby Summer Beaver. "If you give kids hands-on attention and introduce them to the world of imagination through books, you give them something that can overcome poverty and despair," says Bartleman, whose mother is Ojibwa. See Tribal Teens Use Film to Tell the Stories of Who They Are over in Newspaper Rock for an inspirational article. Forum Theatre: Reclaiming Our Aboriginal LanguagesUBC Aboriginal Languages and Literacy Institute (ALLI 2006) and Headlines Theatre are seeking 20 Aboriginal people to participate in a unique process where they will work with theatrical games and exercises to bring out the core stories of their struggles with the loss of their traditional Aboriginal languages, and the challenges of reclamation and revitalization of their linguistic heritage. What is Forum Theatre? Forum Theatre is a unique type of participatory theatre. The play that develops out of the workshop is usually quite short--perhaps 5 or 10 minutes in duration. It is run once, all the way through, so the audience can see the situation and the problems presented. The play builds to a crisis and stops there, offering no solutions. The play is then run again, with audience members able to "freeze" the action at any point where they see a character struggling with a problem. An audience member yells "stop! ", comes into the playing area, replaces the character s/he sees in a moment of struggle, and tries out his/her idea. Native American students expand their scribal skillsA new writing immersion program is giving a dozen teenage visitors from a Southern California Indian tribe a crash course on finding their inner muse—and using it to beef up their college application essays. The pilot program brought six boys and six girls to the University of California, Berkeley for a week-long visit to museums, bookstores and even a local publishing house where students could learn about the craft of writing and find inspiration for a series of writing projects that encourage free expression.Comment: Not a way to preserve Native languages, but a way to get Native kids involved.